This new schoolyard garden at Key Elementary is a great example of the potential for community and school collaboration. With the help of the LoMo Education Committee, Key School received a Lowe’s Toolbox for Education grant to purchase building and startup supplies. 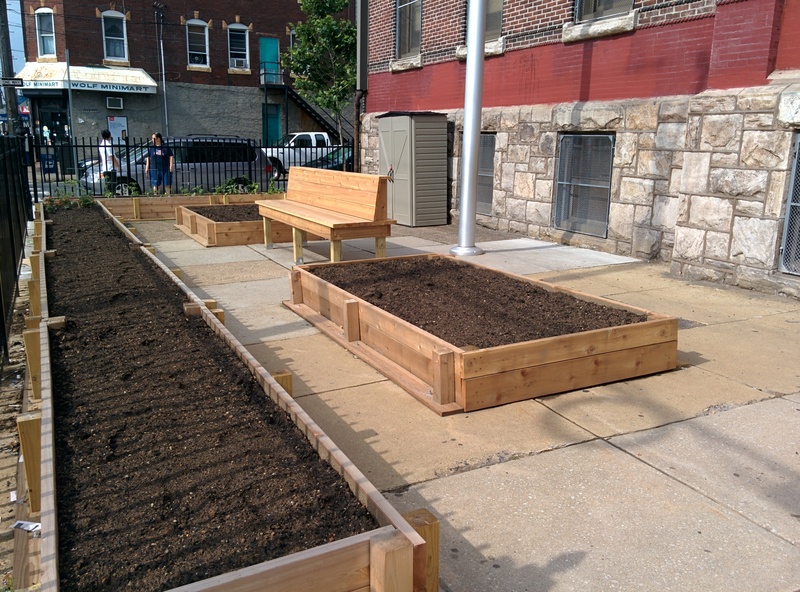 Molly Devinney, then coordinator of the South Philadelphia High School Gardens, helped plan the project and secured the help and expertise of SPHS’s Carpentry program, led by Paul Koval. Mr. Koval and his students designed and built the garden beds, benches and planters. (And did the heavy lifting of getting them filled!) Student volunteers from Central High School also stepped in to assemble the new shed. While school is out for the summer, community groups are stepping up. The LoMo Education and Environmental Committees are partnering with Friends of Mifflin Square, the Migrant Education Summer Program and SEAMAAC’s Roots of Happiness: Elders Health and Wellness Program to plan for garden care and explore possibilities for inter-generational collaboration and learning. As the school year starts up again, LoMo will continue to support the garden project and seek additional funding. The LoMo Education & Environmental Committees are looking for volunteers who want to contribute to this garden project. Rebecca Wanner will set up a meeting soon to go over the logistics and plan garden care times. Please be in touch if you are interested! The LoMo Happy Hour is Back!